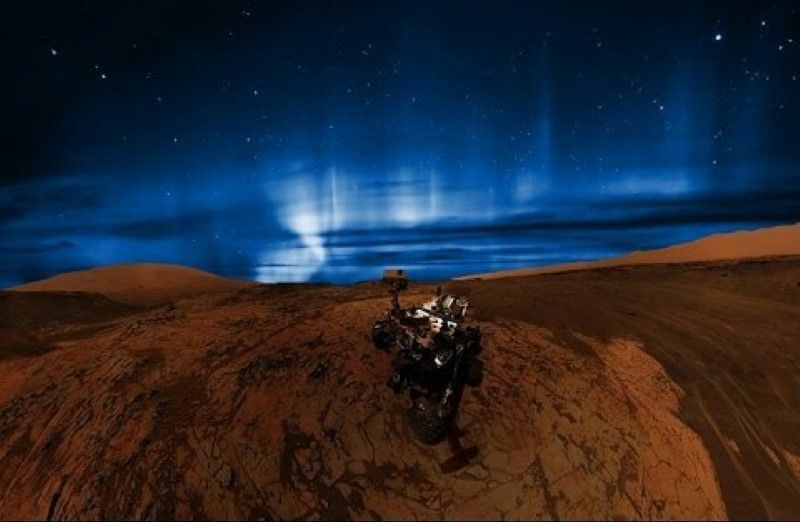 Astronauts visiting Mars in the future will be awed by dazzling auroral displays in the planet’s southern hemisphere, a new study suggests. While previous research had confirmed the presence of beautiful “southern lights” on Mars, the new study predicts for the first time that the auroras of the Red Planet may be visible to the human eye. “An astronaut looking up while walking on the red Martian soil would be able, after intense solar eruptions, to see the phenomena with the naked eye,” study co-author Cyril Simon Wedlund, of Aalto University in Finland, said in a statement. Auroras on Earth, known as the northern or southern lights, occur when charged particles from the sun are caught by the planet’s magnetic field. As these particles excite the atoms and molecules of Earth’s atmosphere, they produce light emission. The well-known greens and reds stem from the excitation of oxygen, while blue and purple colors result from ionized molecular nitrogen. Although Mars no longer has a global magnetic field, small fields still appear sporadically across the planet today, primarily in the southern hemisphere. Whereas Earth’s global magnetic field funnels charged particles toward the north and south poles, the more sporadic fields of Mars make the location of the auroras more variable. Previous observations by the European Space Agency’s Mars Express spacecraft and NASA’s MAVEN mission confirmed the presence of auroras on Mars, but could not determine if they would be visible to humans. The scientists loaded up this Planeterella with carbon dioxide, the dominant component of the thin Martian atmosphere. An electrical discharge was created in the region similar to the planet’s upper atmosphere, creating a blue glow that followed the magnetic field structure. The “Oort Star” –Did a Rogue Star Pass Through Our Solar System?